Is worry something you do every day? 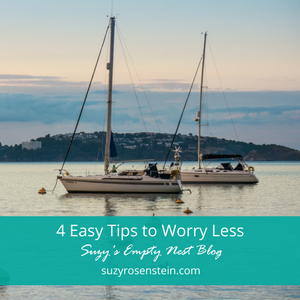 So many of us waste too much time on worry, so here are 4 easy tips to worry less. Are you curious why you choose to worry? But…there’s more to the story. I’d like to suggest that you do actually choose worry, on purpose. And it’s weird because it’s so negative, so uncomfortable. Worry can easily lead to an all out freak out sometimes, but we choose it anyway. When I say that you choose it, what I’m referring to is the Thought Model. Now, if you’re a regular listener of my podcast, Women in the Middle or follower of my blog, you’ll probably remember that the thought model is a tool I use to help you sort out and get perspective about what’s going on in your mind. There are five different parts to the Model. First, there’s something we call a circumstance, or fact. This is what happens or what has happened. It’s factual, black and white. Then, we have thoughts. Thoughts are sentences in your mind about the circumstances or facts. These thoughts are optional, and they create feelings. Feelings drive your behavior. And then your behavior creates your results, which always prove your thoughts. 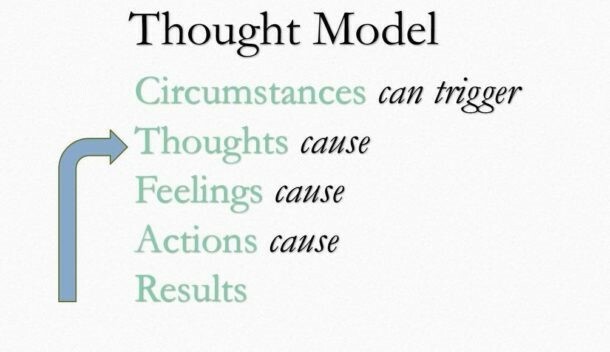 This thought model is pretty much the secret sauce of the universe. It’s super helpful to understand what’s going on up there in your mind. Listen to Episode 2 of this podcast if you would like more information and context for the model. 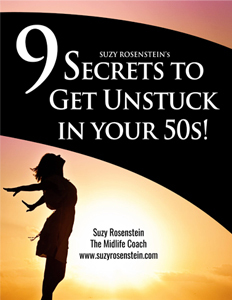 It originates from Brooke Castillo’s work at The Life Coach School, where I was trained. So, the reason I just reviewed the model was to point out where feelings come from. They come from your thoughts. They come from your thoughts. When you take an emotion like worry, it can get a bit confusing because worry really feels like it comes directly from whatever it is that you’re worried about. It doesn’t feel like you have a choice. Worry really doesn’t feel optional. Let’s look at something specific. Like, if your husband is on a flight home and there’s a snowstorm, you might start to worry. Or if your kid traveled back to college and didn’t call you when he got there, you might start to worry. Both of these examples feel like the worry is coming from the thing that happened. It’s really common to think this. Like I said, worry doesn’t feel optional at all. But, as you can see from the thought model, there’s something in between the circumstance and the feeling. Circumstances are actually neutral. It’s your thought about the circumstance that isn’t neutral at all. For me, my typical thought is something like this: It’s dangerous; they’re going to die. That thought creates immediate worry. When I choose it, I feel horrible. There are always many other ways to think about things, but this is my “go to” thought. And worry is then created by this thinking. Worry is pretty interesting because it pretends to be necessary. It really feels that way, like there are no options. Here’s an example from a couple of weeks ago. I’m on a beautiful family vacation with my kids on a 52 foot catamaran with a company called Tradewinds. It was planned for a year. Sounds amazing right? A picture perfect vacation set up for big time relaxing. Yes, it really is…if you can figure out how to relax. It’s no joke planning and actually taking a family vacation. You end up doing most of the prep work to get your family out the door. It’s pretty exhausting and once you get to your destination, if you didn’t need a vacation before, you need one now. To add to my stress, my kids decided they wanted to get their scuba certification, just like their dad. Lovely. One more thing to worry about. Scuba is NOT for me. I’m a snorkling gal. Anyway…the best seat on a catamaran is the dolphin seat way up front. You sit there and dangle your legs down off the seat, over the water. It’s glorious. Best place not to get seasick too. I love sitting there. Great place to watch the world go by as you’re sailing across the beautiful ocean with a warm breeze in your hair. Great place to let your mind wonder. As soon as I had a chance to relax, to quiet my mind, to exhale and enjoy….all kinds of thoughts popped into my brain and created worry. I had worked so hard to get us all in this amazing place doing this amazing thing and there I sat, full of worry and stress! I started thinking about skin cancer. I started to think about what would happen if someone had a medical emergency way out here in the middle of nowhere on a boat. Of course I started worrying about the kids, who would now be diving 60 feet under rather than snorkling at the surface with me. So much for my relaxing sailing vacation. I had a choice and I chose to worry. Now, because I’ve been working at this mindfulness stuff for more than a few years, I’m on to myself. I knew that I didn’t have to be at the effect of my thoughts. That, even though the thoughts popped in, I still had control and could supervise my mind. We feel so justified feeling worried; to me, it seemed so obvious that I should be worried. But worry is just an emotion, like any other emotion. It’s caused by thoughts. Often, habitual thoughts. Thoughts you’ve been practicing for years, maybe even decades. And you can see how poisonous these types of thoughts can be. They can really work to keep you from your amazing life. So why do we do this? Why do you do this? Why choose worry? First, worry is serving a purpose. keeps you safe in a weird way. It’s keeping you stuck doing what you always do rather than going forward and trying new things or new perspectives. It keeps you comfortable rather than stretching, growing and trying new things. Second, worrying is a habit. You’ve practiced thinking the thoughts that create worry for years and years and years. Like any habit, you’ve been repeating it and it’s easy. So you do it. It’s like a muscle you’ve been exercising. Like driving. You don’t even think about it anymore. In my vacation example, worry was keeping me from relaxing and enjoying my time on this beautiful boat. I was used to worrying. Relaxing is something that feels like it’s in short supply. It’s not as much as a habit as worrying. So as soon as there was an empty space, it got busy with thoughts about danger and unpredictability. With worry, it’s so important to catch it as soon as you feel it. If you feel worry, you know something’s going on up there that you need to notice. You might feel the feelings before you know the thoughts creating them, but any which way, you know you’re thinking something that’s not useful. You don’t have to be at the effect of these thoughts. That’s where supervising your brain comes into play. The model shows you the way. Here are the 4 main steps to supervising your brain when you choose to worry. First, start with being the watcher of your thoughts. This means creating that bit of distance based on the knowledge that you’re not your thoughts. You have the ability to SEE them but not be at the effect of them. You have the awareness they are there. You know they’re creating your feelings. But you don’t need to be afraid of them or feel helpless. 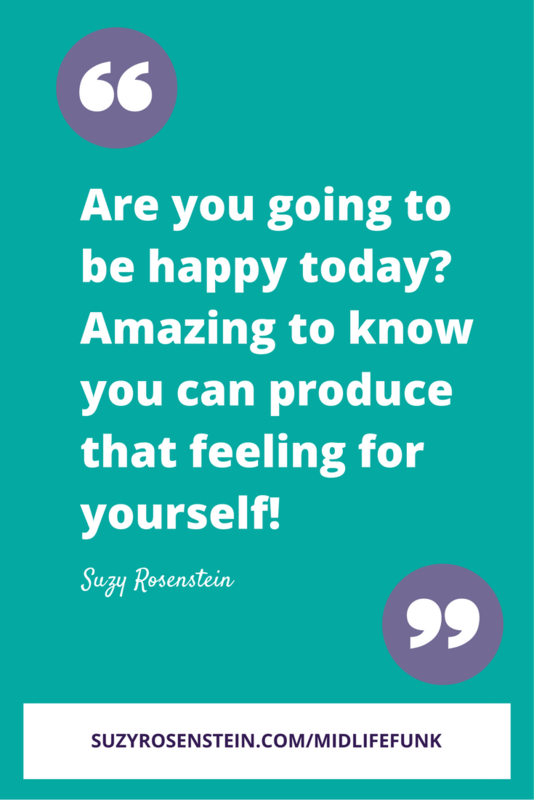 Second decide how you want to feel on purpose. This means actually thinking about the emotional experience you want. Do you want to be confident? Excited? Calm? Relaxed? It doesn’t matter what you want to feel. It matters that you think about it and acknowledge it. Third, figure out the thought you would need to think to create that feeling. The one you WANT to feel on purpose. Really think about this. Take the time to make a decision. Fourth, practice thinking the thought. This is how you supervise your brain. You notice what’s going on. You decide if it’s what you want. You correct the thought if it’s not useful to you. And then you practice the useful thought. You may need to remind yourself to think the useful thought, but that’s OK. Do what you need to do! There you have it. A simple plan to help you supervise your brain so you can worry less. I have to say, since I’ve become a life coach, I’ve seen first-hand how empowering the mindfulness strategies that I teach my clients and students can be. Especially in midlife. I’ve seen it with myself too…with my vacation last week and with many other examples too. What all of this illustrates is the speed with which we can manufacture our emotions as a result of our thinking. Yes, your thoughts create your feelings. Even when it comes to what you worry about. Mindfulness can really change your life. Download my FREE worksheet to help you get a handle on what’s going on up there so you can worry less too!